No matter where you look these days, it seems “little bikes” are becoming more and more prevalent, both on the street and on the racetrack. They’re all the rage. But not so long ago, most riders weren’t interested in riding smaller displacement bikes; most wanted to try their luck at taming the bigger machines. Somehow, bigger, more power, faster would -in turn- make them faster riders on the racetrack or the county backroads. Little do they know, they’ve created a great hurdle when it comes to learning to ride correctly. For anyone who’s been to a track day, you see many riders struggle to ride bigger bikes, only to wind up being “that guy” screaming down the straightaway and parking it in the corners. This often leads to frustration to the point of cliché between the larger and smaller displacement motorcycles. The bigger bikes are fast on the straights -sure- while many on smaller bikes feel the frustration of driving slow through the corners behind that very same bike that outgunned them on the straightaway. Sound familiar? But something has happened in the past few years. It seems there’s a whole new level of interest and appreciation for these smaller bikes. Many instructors, myself included, encourage riders to start on a smaller displacement motorcycles for good reasons. For one, it removes unnecessary power from the equation and allows the rider to focus on the fundamental controls and inputs required to pilot a motorcycle correctly. Riders tend to be more focused and learn at an accelerated rate, vs. “surviving” a lap on a racetrack. Though I make many references to riding on the racetrack, this applies equally to the street. Smaller motorcycles can stop faster (less mass), are easier to turn and are more forgiving of mistakes. Whether you’re a new rider or a veteran, we all make them. Still think it makes sense to learn how to ride on a bigger bike? As the rider becomes more proficient with these riding fundamentals (smooth throttle and brake inputs, body position + timing, etc. ), command of the motorcycle becomes much more natural, controlled and predictable. Over the years, I’ve heard the saying, “A wise man once said, you must go slow to go fast…”. I’m of the firm belief that this genre of wisdom applies to riding a bike with abilities greater than your experience can control. This doesn’t mean that your first track bike needs to be a Ninja 300 or a new Yamaha R3. But when you consider the amount of fun and accelerated learning the smaller bike has to offer, it becomes the wise choice. 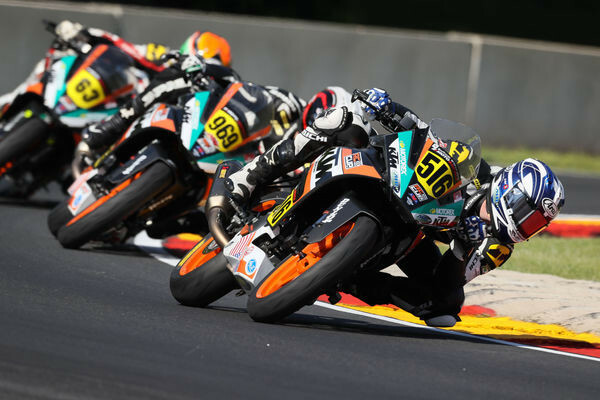 If you look at the club racing organizations like ASRA, CCS, WERA or a professional Roadracing series like MotoAmerica, the small bike classes have gained quite a bit of attention. The ultra-lightweight classes (F Superstock, KTM 390 Cup, etc.) require the motorcycle rider to refine their racecraft both physically and mentally. Let’s highlight Brandon Paasch and Anthony Mazziotto for a moment, two of the top riders in the MotoAmerica KTM 390 class. Many of these races were decided in the final laps of the race. It wasn’t about horsepower, especially in a spec series where everyone has essentially the same equipment. These were battles that commanded a high level of focus and precision control from their pilots, corner by corner, lap after lap, hoping their opponent would make a mistake costing them a vital position. Drafting, when to lead, when not to lead were all factors in these races. All of these facets of racing are exaggerated or amplified when riding smaller motorcycles as you simply cannot draw upon power to correct a mistake or gain position. 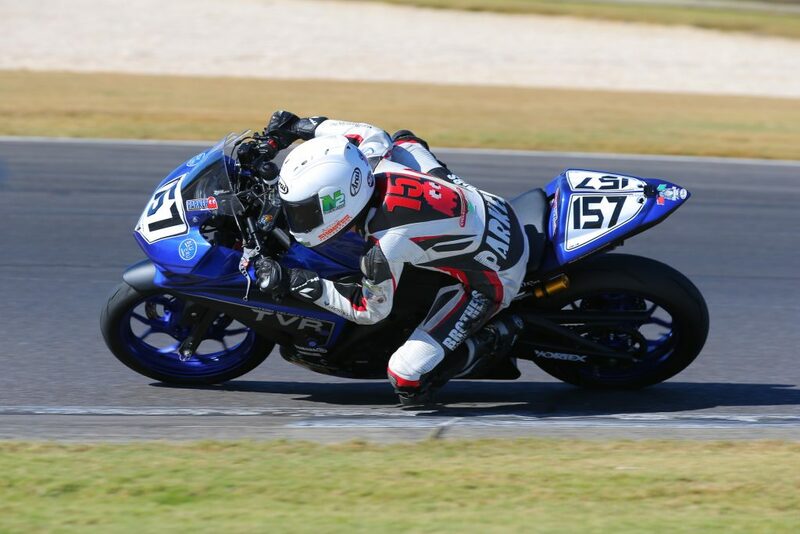 In another example, we have this year’s WERA FSS #1 plate holder, Garrett Parker, winning the championship on his Yamaha sponsored R3, and the list goes on. If the 2016 track day season is any indication, the small bike “syndrome” continues to catch fire and is showing no signs of slowing. In my opinion, I feel many riders are starting to see the benefit of advanced rider education and knowing that they’ll learn far more -and faster- on a smaller bike than they would a liter bike. It’s also a matter of pure fun. I’ve also observed many seasoned, highly experienced riders purchasing these ultra-lightweight bikes as another means of fun and learning, not to mention being easier on the wallet. I can tell you first hand, these bikes bring a whole new level of fun to the racetrack. Earlier this year, I rode Chuckwalla for the first time with the good folks at Track Daz and a few riders from Yamaha corporate. Part of the day included 8 or 9 of us taking R3s onto the racetrack for a little showdown, many of us experienced track day riders and racers of varying levels. This was some of the most fun I’ve had on a motorcycle during the season. Picture a gaggle of grown men on these Yamaha R3s, all fighting for who’s going to reach that finish line first. Truth be told, I don’t recall who finished first, but we all remember the epic battles had that day. Whether you’re looking for a new pony in the stable or just working on your riding skills, the ultra-lightweight motorcycle is an excellent platform and is easy on the wallet with plenty of after-market parts available for you to spend your hard earned dollar.